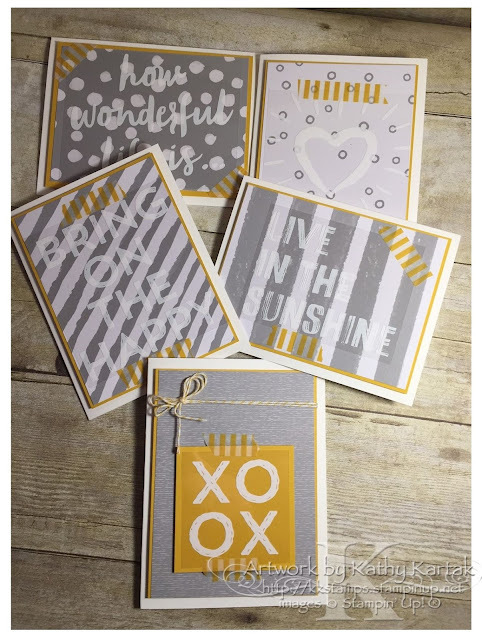 #stampinup #faithfulinkspirations #paperpumpkin As 2016 draws to a close, I'd like to thank YOU for reading my blog, for leaving comments, for pinning my creations, for encouraging me as an artist, and for supporting me as my customer. I appreciate every, single one of you! Just like Stampin' Up's statement of the heart--it is a joy for me to love what I do and to share what I love. 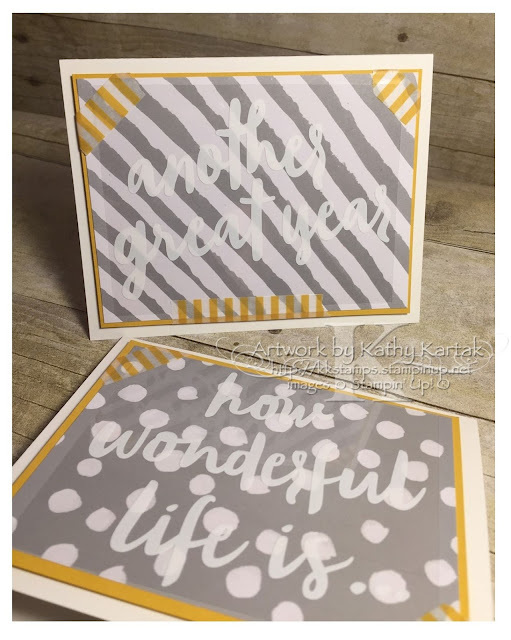 I'm closing out the year with the December 2016 Paper Pumpkin kit, "Another Great Year." If you're not a Paper Pumpkin subscriber--you should get on the bandwagon! If you're busy and think you have no time to craft and don't want to set aside a whole closet room floor in your house for the supplies you need, Paper Pumpkin is your answer. You can create wonderful cards and projects in about an hour. Everything you need comes in one box. I love receiving my kit each month. I love the surprise and I love the quick projects. Paper Pumpkin truly is "creativity in a box." Here's a video to show you everything you get in the December 2016 kit. After you watch the video, if you're kicking yourself because you didn't get this kit, let me know and I can hook you up!! And keep reading because I'm also showing you alternate uses for the kit's supplies after the video! I made six great cards using the supplies in this kit! Look! Yes, I can count. I know there are only five cards in the picture. I gave one card to my hairdresser as a New Year's card. Here's card number five (with a "friend). I added Thick Whisper White Card Stock card bases and a 3-7/8" by 5-1/4" Crushed Curry mat to each card. I cut down the journal pages to 3-3/4" by 5" and adhered these to the Crushed Curry mats. I adhered this assembly to the card base using Stampin' Dimensionals. I adhered the printed window sheets to the cards with the striped Crush Curry Washi Tape that comes in the kit. Super easy! If you'd like to subscribe to Paper Pumpkin you can click on the link to the left of this blog post. It costs only $19.95 (including shipping) per month for an hour of creativity. However, if you purchase a 3- or 6- or 12-month prepaid subscription, you'll save money. You'll save $1/month on a 6-month subscription. And you'll save $2/month on a 12-month subscription PLUS you'll qualify for Stampin’ Rewards (FREE stuff!). And if you subscribe to a 3-, 6-, or 12-month subscription during Sale-a-Bration (January 4 through March 31, 2017) you'll qualify for FREE Sale-a-Bration items! What a deal! What are you waiting for?! Contact me today to get started! #stampinup #faithfulinkspirations Today is the second-to-last day of 2016 and my last post of the year. The year has brought sadness and struggles. I've been heartbroken over the deaths of some giants in show business, science, and a few people I hold near and dear to my heart. I've been saddened by tragedies locally (my hometown, Ellicott City, suffered devastating flooding) and in our country (floods elsewhere and fires that took the homes of people I love) and in the world (the heartbreaking tragedies of war). But through the sadness and struggles I saw people whose faith carried them through and who passed that faithful strength and resilience onto those of us who were fortunate enough to be spared from tragedy. I hope I can be a faithful example when my time comes to face struggles in life. As I look back over the year, I choose to think about the good things and to count my blessing--my twins are finishing high school and looking forward to heading off to college in the fall of 2017. My family is healthy and happy. My church is strong and faithful and full of people who minister to our community. I have a job I love and people I love to work with. And I have a hobby that makes me happy and allows me to share happiness with others. Last year, I followed Shannon West's lead to bring back birthdays. #imbringingbirthdaysback And I sent many more birthday cards in 2016 than I'd sent the previous year. I'm still bringing birthdays back in 2017. If you would like a birthday card in the mail, send me your birthday and address and I'll put you on my list. My contact information is above. I'd love to DOUBLE the number of cards I send out in 2017!! 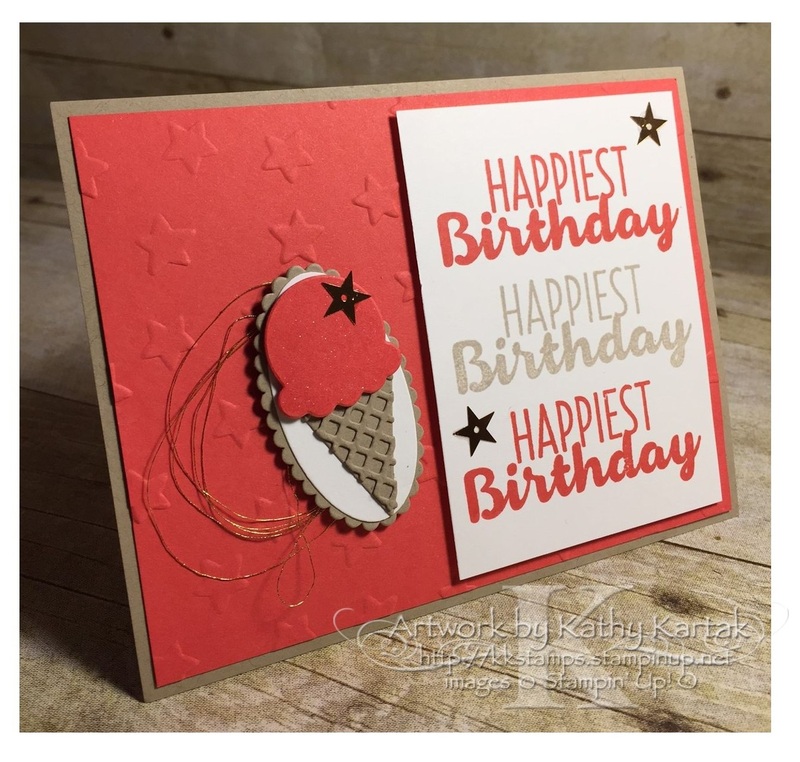 Here's a really pretty birthday card made (again) with the Cool Treats Bundle (145182, page 32 in the Occasions catalog). I started by stamping the sentiment from the "Cool Treats" stamp set on a 2-3/4" by 3-3/4" Whisper White panel, once in Crumb Cake and twice in Watermelon Wonder. Next, I embossed a 4" x 5-1/4" Watermelon Wonder panel with the Lucky Stars Embossing Folder. I adhered that to a Crumb Cake card base. I added the stamped panel to the card with Stampin' Dimensionals. To build the ice cream cone element, I cut a Crumb Cake scalloped oval and a Whisper White oval from the Layering Ovals Framelits. I cut a Watermelon Wonder ice cream scoop and the Crumb Cake cone and waffle element with the Frozen Treats Framelits. I adhered the waffling to the cone using the Fine-Tip Glue Pen and adhered the cone directly to the oval element. I used Stampin' Dimensionals to adhere the ice cream scoop. I tousled some Gold Metallic Thread and adhered it to the back of the oval element before adhering it to the card using Stampin' Dimensionals. 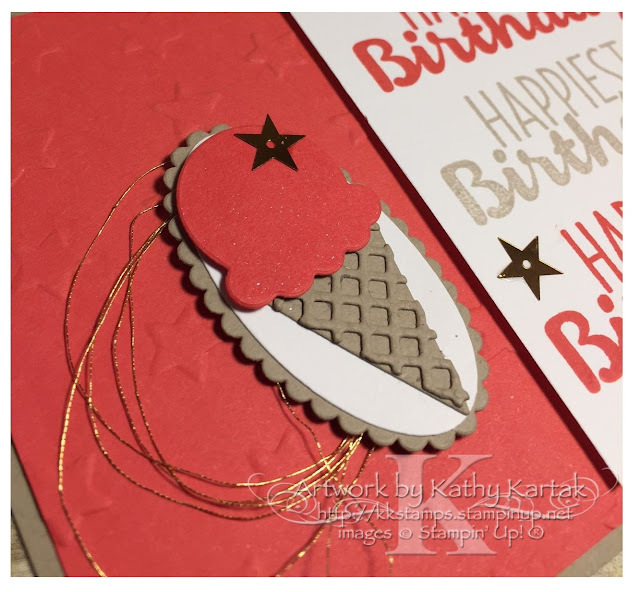 To add some more sparkle to the card, I colored the ice cream scoop with Clear Wink of Stella and added three gold stars from the Metallics Sequins Assortment. I hope you have a wonderful New Year. Remember to count your blessings!